iBake ERP software manages all aspects of your business, right from the time a material enters into your facility until the finished product is with your customers, into one system. This allows all departments to work within the same software with access to the same data.iBake ERP promotes seamless workflow between departments, greater efficiency and more cost effective business practices. 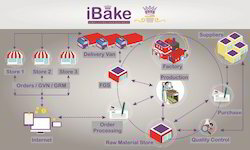 Backed by an experience of 12 plus years, this iBake ERP system takes care of everything across your value chain. By helping drive innovation, managing recipes, planning efficiently, simplifying processing, checking quality and adhering to regulations,iBake ERP for bakeries reduces the complexities of running a business. iBake ERP is a bakery industry specific solutions that help bring your products to market, faster and more cost effectively, while ensuring product quality and compliances. Set up mandatory quality audits and checks from pre receipt of materials all the way to output and shipment. Looking for Bakery Software ?